Clap at the appropriate times. If you’re confused as to what constitutes “appropriate” Continue reading How Much Did NBC Pay Kosuke Kitajima To Troll The US Olympic Trials? I’m gonna go out on a limb and say that most people who saw Seth Gordon’s fantastic 2007 documentary, King of Kong (a film about two middle-aged men–a middle school teacher and a condiment magnate–duking it out for the Guinness World Record on Donkey Kong), were not quickly inspired to follow in the principal characters’ footsteps. Though respectfully portrayed, most of the people featured in the film are lovable losers, aging dorks, gamer geeks–and the addiction itself so all-consuming that it alienates even our hero from family, home and daily life. But of course, someone did. Hank Chien, a 35-year-old plastic surgeon from New York, started playing the game after seeing the film. He recently broke the standing record, held by longtime recordholder Billy Mitchell, with 1,061,700 points in two and a half hours. The score was 10,000 higher than Mitchell’s. After becoming the youngest player to qualify for an LPGA tour event at age 12 and turning pro at 16, only to have her career declared “over” by age 18, Michelle Wie’s finally won her first LPGA tour title. Wieeeeeeeeeee! “I still have a lot of work to do”…that’s music to our Hardass Asian Ears! Congratulasians to Hideki Matsui, who was named World Series MVP after the Yankees finished off the Phillies, 7-3, in six Wednesday. Matsui, whose nickname is “Godzilla” in Japan, had a monster night in the Series clincher–he homered, doubled, and singled while tying the record for most RBI (6) in a World Series game. The 35 year-old hit .615 in the Series overall. Matsui is the first Japanese-born baseball player to receive the Most Valuable Player honor and described Wednesday night as “the best moment of my life right now.” It also may have been his last moment as a Yankee, since he’s reached the end of a four year-contract with the team. So what’s next for the Japanese outfielder/DH? Congrats to the Lakers on winning their 15th championship Sunday night!!! Most especially to shooting guard Sun Yue, aka the Luckiest Mofo Evar, who’s the 5th Chinese baller to play in the NBA and only the 2nd Asian player to win a championship. DUDE. You’re AWESOME. 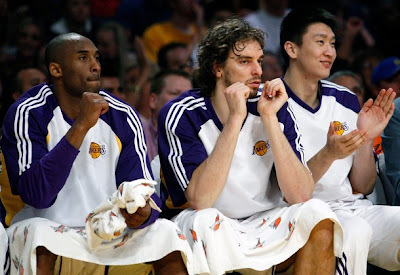 You sign with the Lakers in August, get mono, delay your start until December, play in only 10 games before getting sent down to the Developmental League (“D-League” for short, like “D-List” or “D-Student”), return to the Lakers just in time for the playoffs, where you play 0 games…and still manage to get a ring. DUDE. I mean, DUDE. That takes mad skillz!!! Your ability to never come off the bench makes you a prime candidate down the road for 6th Man of the Year (or Invisible Man, I’m not sure which). Your fist-bump stroke is absolutely gen-i-us. And the way you park it on the sidelines the way big men park it in the paint? Quite frankly, the stuff of legends. Speaking of legends, Charles Barkley, Karl Malone, and Patrick Ewing all committed harakiri late Sunday night when they discovered that Sun Yue has a ring now and they still don’t, and that, no, this was not just some horribly cruel joke. Can I call you Alex? I feel like I can, since you’re Chinese-American and I am, too, and we have the same last name, which means we’re practically related. First things first–congratulasians on winning the CFDA/Vogue Fashion Fund award! You rule! Your clothes–a clever mix of grunge street urchin and 80′s lady—are the bomb! Anna Wintour has found room in her icy, unsmiling, chinchilla-clad heart to love you! In other words, you have arrived. And now that you’ve arrived, you really don’t need advice from anyone, except your CFDA/Vogue Fashion Fund mentor who comes with the prize. But allow me to make one small, albeit bold, suggestion–as bold as those raggedy denim cut-offs you designed for fall and had the balls to charge $285.00 for when they look like that item of clothing one feels is too trashed to even donate to the homeless–please start saying our last name right. “Waaaang” is waaaaack. “Wong” is right. There is, I’m afraid, no middle ground. Think of this as your Demi Moore moment. Remember back in the late 80′s, circa Ghost, when Demi Moore went from being known as “Dem-ee” to “Duh-mee,” seemingly overnight? Of course you don’t, because you were just a wee lad back then. But, look. It happened. And everyone got with the program. And instead of people being, like, WTF is up with that, they threw money at this born-again creature “Duh-mee” and she became the highest-paid female movie star in the land (until she did The Scarlet Letter, Striptease, and G.I. Jane in that order and all but killed her career, but that’s another story). You’ve made it, sweetie. Which means that people have to start saying your name right. You could even pull a Prince and start going by a symbol, and people would have to respect that (please don’t). And you don’t want to mistaken for, like, Vera Waaaang’s relasian, do you? She’s so yesterday’s news. And you, my friend, are the future. 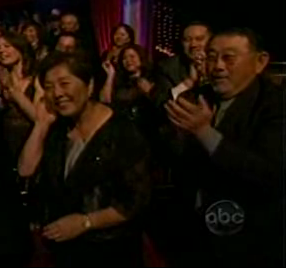 Kudos to Kristi Yamaguchi for winning Dancing with the Stars last night! CAROLE: Well, that was nice. JIM: Yes, our daughter did very well tonight. Although I noticed that she was a little out of sync during that jive routine. But, all in all, she was nearly perfect. CAROLE: I completely agree. She was almost perfect. JIM: Quite close to perfect. CAROLE: Just shy of perfect. JIM: A hair away from perfect. CAROLE: Perfect by most standards. JIM: As perfect as humanly possible. CAROLE: Perfect according to the judges. JIM: True, true. Her final scores were indisputably perfect. CAROLE: Well, this night was pretty much perfect, don’t you think? JIM: I completely agree. Tonight was about as perfect as it gets.